Why does North Carolina want to force transgender persons to use the wrong public toilet? Why the steady stream of foredoomed bills demanding evenhanded treatment of evolution and creationism? And why endless attempts to mount official displays of the Ten Commandments, when such displays have repeatedly been ruled to breach the wall between Church and State? Toilet etiquette is where prudery meets absurdity. Your chance of being embarrassed, let alone molested, by a transgender person in a US public toilet is probably zero, and certainly less than your chance of being shot dead at home by a toddler playing with a gun; after all, the only public display of genitalia is at the men’s urinal, and you can always use a booth if you prefer. It is established law in the US that the teaching of creationism serves a religious, rather than scientific or educational, purpose. It follows (Edwards v. Aguillard) that such teaching is unconstitutional in US public schools, since it violates the First Amendment separation of Church and State. There is no prospect of this ruling being overturned, unless we ever get a US Supreme Court packed by a creationist President. It has also been repeatedly established that display of the Ten Commandments on State government property violates the US Constitution, for much the same reasons. So why do we have States bringing in transgender bathroom laws, scientifically baseless (as discussed here by my friend Faye Flam), whose only effect would be to inconvenience and offend one particular small minority? Why did this monumental non-issue even spill over into the moronic drivelfest of the Republican Party’s nomination debate? Or attract so much attention that Pres. Obama’s statement of the obvious on the subject has been hailed as “historic”? Why do we have a whole evolving family of “sound science teaching” bills, which would single out evolution, together with climate change, as subjects concerning which students should be taught “both sides”, or the “strengths and weaknesses” of what is in fact well established science? And why should the current Chief Justice of the Alabama Supreme Court keep on asserting his right to display the Ten Commandments in his courthouse? Does he really think it necessary to inform litigants that God brought them out of Egypt, wants them to be nice to their parents, and disapproves of graven images? Stupidity? No, strategy. And a strategy that is highly evolved, if not indeed intelligently designed. Consider how much these issues have in common. For a start, there is nostalgia for an imagined era of moral clarity and biblical belief. This feeds in to what is, I suspect, the most powerful of all political motivators, namely the sense of identity. We think as we do and vote as we do because of the kind of person we think we are, or at any rate would like to be. And these three issues translate as assertions of a very American kind of Christian identity. As a corollary, they define an enemy; the smug Liberal sneering at those who disagree with him (would that this image lacked validity). They are timeless, unlike the real issues of foreign policy and budgets; they will still be with us ten budget cycles and three foreign entanglements down the road. And they work as attention grabbers, and as group identifiers. The major US retail chain Target thought it worthwhile to issue a statement inviting people to use the toilets fitting their self-description rather than their birth certificates; in retaliation, a group calling itself the American Family Association has launched a boycott petition that has gathered, so far, over 850,000 signatures. I do not know what evils the AFA plan to blame on Target, but they are among those who blame Darwin for Hitler, so they’ll think of something. AFA regards calls to action on climate change as impious, since the planet is in God’s hands. It also defends public display of the Ten Commandments, on the grounds that “the Ten Commandments are the basis of all of our laws.” These views form an identity cluster, and the inclusion of climate change denial is no accident. And finally, by the same token, they are perfect distractions from reality. American readers, at least, could hardly have failed to notice the transgender toilet controversy. But how many of us are even aware of evidence published earlier this month that warming is already reducing the availability of oxygen in the oceans, and that this effect will probably be widespread by the 2030s? We could be talking about the erosion of democracy, looming water shortages in the US and Asia, the unstable world banking system, climate change, and the facts of economic inequality. Or we could be talking about who is allowed to use which bathroom. If you were a North Carolina legislator, which would you prefer? Mahaffey anecdote from Sorenson h/t Abbas Raza. An earlier version of this piece appeared in 3 Quarks Daily. Do we need more studies on vaccines, GMOs, climate change, etc.? Global warming: Could we hide rising seas in sunken deserts? Would the depressions that exist below sea level in 49 countries, many in desert regions, provide a way to accommodate rising sea levels? No. Dead Sea shoreline, 429 metres below sea level. This weekend, a friend asked me if the rise in the oceans could be drained off into the world’s below-sea-level depressions. 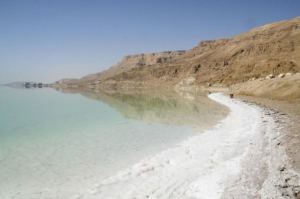 Could rising ocean waters be diverted to fill the Dead Sea and Death Valley Depressions, for example? It seems a creative solution. Instead of flooding the Maldives, Piazza San Marco, and south Florida, the expected ocean level rise could fill some of the Earth’s less inhabited wastelands instead. Financial system failing; real problems of climate, environment, resource limitation, and looming food shortages ignored; long-term consequences never considered; rising inequality; a rewards system that stops the market from behaving rationally; democracy ineffective against the influence of the financial elite. Who says? Left-wing intellectuals like Naomi Klein, contrarian Nobel Prize economists like Krugman and Stiglitz, political dissidents like Syriza in Greece, Podemos in Spain, or Scottish National Party, Green, and a cetain Labour would-be leader in the UK? 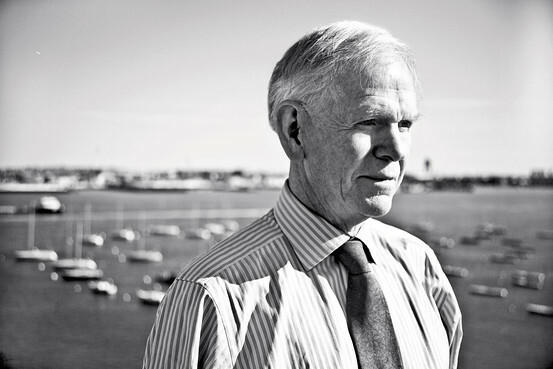 No; one Jeremy Grantham, financial strategist whose firm manages more than US $118 billion in assets, in his keynote address to the 2015 Morningside Investment Conference in Chicago. I don’t normally write about financial matters, but here we have the chief strategist of one of the world’s largest asset management firms delivering one of the sharpest critiques of what now passes for capitalism that I have ever seen, and his remarks* deserve far wider circulation. Resource constrains, low capital expenditure, inequality itself, climate pressures, and the low-hanging fruit is mostly gone. Facebook is not the steam engine. Human folly, avoiding unpleasant information, leading to bubble after bubble as we repeat past mistakes, and deny or ignore the really important matters, like climate change. Resource limitations. Conventional economics pays no attention to this, and assumes endless growth, as if the free market were a perpetual motion machine that would never run out of anything. Climate problems. Tree ring data show that California is the driest it’s been in 1,200 years. The cotton crop in Texas failed for 6 years in a row because of drought, and then came devastating floods. Income inequality. The economy can’t grow when wages are failing to rise. Bad management by the central banks, and a corporate culture where 80% of the rewards of top management are in stock options, making financial manipulation (specifically, share buyback using cheap borrowed money) more rewarding than real investment in new productive capacity. This is not really effective democracy in action. Finally, market bubbles. These are built into the structure of the financial industry. Investment managers protect their jobs by following the herd. So everyone does the same thing, pushing markets away from correct valuations, and making the rational distribution of resources, which is after all the whole point of free market capitalism, impossible. The rest of Grantham’s presentation was highly technical, directed at his fellow investment managers; that part of his talk is summarised here, as reported by an investors’ website, which did not, however, bother to relay his remarks on the wider issues discussed above. *Behind a pay and membership wall, but this summary is my own personal review and may be freely copied with acknowledgement. Yes, climate can change naturally. No, that is not why it’s changing now. By my geologist friend Michael Roberts. 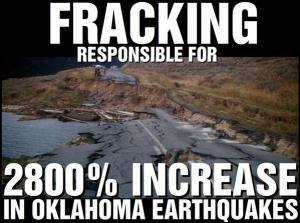 I don’t like it when creationists tell lies and I don’t like it when anti-frackers tell lies, either. My own view, for what it’s worth, is that the Royal Society probably know what they’re talking about when recommending that the UK proceed, but with tighter regulation than that currently at force in the US; that if more methane means less coal that’s a good thing (coal has twice the carbon footprint per unit of energy, as well as a whole shopping list of other disadvantages); that knee-jerk rejection of fracking is the very opposite of evidence-based decision making; and that quantified evidence-based decision making is crucial if we are to keep the lights on while keeping the climate change already in process within tolerable bounds. 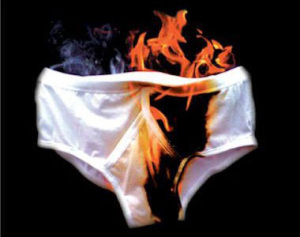 It does seem to me that fractivists wear very Hot Pants and possibly the fire is fuelled by CH4. 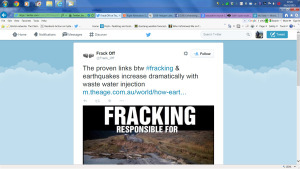 If this was a one-off it would be forgiveable, but porkies like this are the staple fare of so much anti-fracking literature put out whether in print or in the aether.